Here is the deal... A powerful motor drives axles in the rear of this sewer crawler. The motor is so powerful that it would actually cause this 3/16” thick wall square tubing to torque and flex if it were not for the heavy steel stiffeners that get welded in. The stiffener blocks are machined with a notch for welding on the end face of the square tubing. The stiffener blocks get welded about 2 inches inside the tubing and also on the end of the tubing. Welding up inside the tubing can cause your auto dark helmet to flash you because sometimes the arc rays get blocked by the gun nozzle or the tubing. I am using that cheap northern tool auto darkening helmet that I bought for 50 bones. This is not my main welding helmet, its an extra cheap one that I leave at my friends machine shop..and i have been leaving it there for about 2 years now only using it once a month or so. But even though its cheap, it still has sensitivity and delay settings. if you are getting flashed from things getting in the way of your arc, set the sensitivity as high as you can without the helmet darkening from the lighting in the shop, and set the delay to mid range or just turn it on if that is the only option on your helmet. The delay keeps the lens dark for a little while after the arc goes out so you don’t have to look a glowing metal. Increasing the delay will usually allow your helmet sensors to detect the arc again and stay dark before if flashes you. Now isn’t that a good tip. …and also a good reason to make sure whatever auto dark helmet you buy, make sure it has both sensitivity and delay settings. Anyway...back to the precision welding table from Stronghand and how the tooling helps me position the parts for welding. 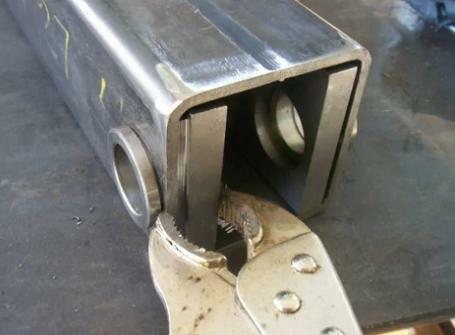 I prefer to weld the stiffener blocks flat to avoid undercut or underfill and it has always been kind of hard for me to get them clamped at just the right height for me to be comfortable and to see the weld clearly…. Even though the weld crown gets machined flat, I still don’t want to leave any low places or undercut…and I need to weld it pretty hot so that when its machined, it wont show any lack of penetration or low places that dont clean up. I dont want to reweld anything. For this welding setup, I used 2 sets of 90 degree angle plates and the set up to do the welding took all of about 2 minutes. I used a machined boss that gets welded in later to rest on the edge of the riser blocks and an "Inserta Clamp" to clamp the crawler in place while I did the welding on the precision welding table. This was a really simple function but the thing that stuck out in my mind was how quickly and easily I even thought of it. that would not happen if I didn't have the tooling in front of me to stimulate my ADD brain. 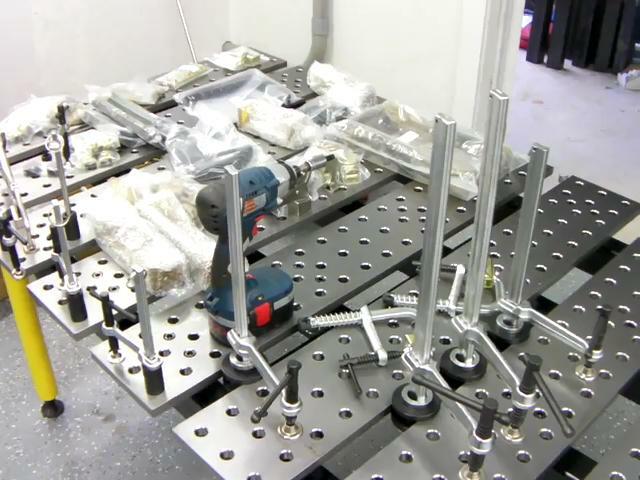 The Next article will show how the tooling package and Stronghand precision welding table will be used to locate the front axle for tack welding.